Not bad at all for £8.02 delivered for Prime members, quite a nice simple look, which is different for me (I have a Batman wallet, because... reasons) £12.01 for non prime, which isn't bad either, really. 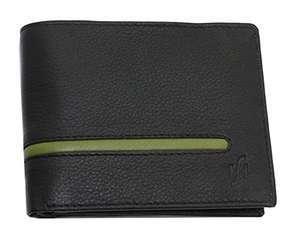 It has up to 5 Credit card / Debit card slots. 2 Window slots for photos or ID cards. A stud button fastening pocket for coins etc. Measures approximately: 11.5cm x 9cm. Looks good for the price. A bit chunky for me though. I have a stealth wallet. And I love it. Looks good for the price. A bit chunky for me though. I have a stealth …Looks good for the price. A bit chunky for me though. 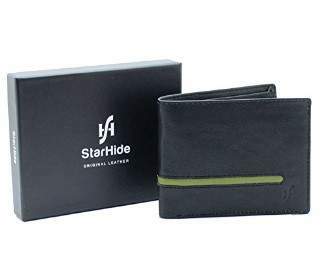 I have a stealth wallet. And I love it. Click the link. It’s basically a metallic card holder. I’ve added a money clip to it, to hold cash. Throughly recommend it. 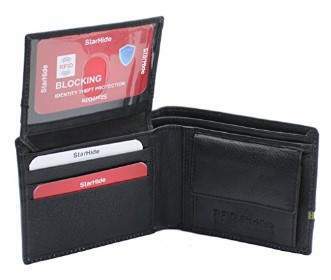 Has rfid protection. question, is there a batman wallet going free? Click the link. It’s basically a metallic card holder. I’ve added a money c …Click the link. It’s basically a metallic card holder. I’ve added a money clip to it, to hold cash. Throughly recommend it. Has rfid protection. If you do get one, I’d recommend the one that comes with money clip. It wasn’t available when I got mine. Sorry to the op. I seem to have hijacked their post. Oh yeah. Strange. …Oh yeah. Strange. https://www.amazon.co.uk/Aluminium-Blocking-Ejector-STEALTH-IMPROVED/dp/B01N1NUK6NIf you do get one, I’d recommend the one that comes with money clip. It wasn’t available when I got mine. Sorry to the op. I seem to have hijacked their post. It’s normal price pal. Always been £15.99 despite amazons fake rrp. it's a complete con - how many instances have you ever heard of it even happening!? I guess for the tinfoil hats around it's a great invention - but they're still having money stolen, just not through contactless machines. They should rename it the brick, nothing stealthy about it. It’s literally the smallest wallet I’ve used. You, spoon. really, the picture on Amazon made it look big. Some people carry portable scanners to read your card details (of course they still need your pin to draw money out) and It becomes more important if you have contactless payment activated Basically someone standing next to you on a train or bus can take a payment form you without you knowing. If you get 7 cards, hold them all together, then that’s roughly the size. It’s smaller than the super slim belroy wallet I wasted about £60 on.